I've been a mess all weekend. Truly. I've been as stressed as I've been in my life, trying to learn a new technology deeply enough to teach it. It's one thing to learn a tech enough to be capable, but in my new role at Microsoft I'm feeling more of a sense of responsibility than I did when I was just Joe Public Who Talks Loud. Anyway, I finally realized that I wasn't reaching out enough to my network of friends/peers/colleagues. This is probably because I'm still getting used to working from home. It's lonely sometimes, and I can't just drop over to a friend's cubicle. This solitary feeling has made me "buckle down" and try to figure things out more that I used to, since I can't just pop into an adjacent office. Well, my personal lesson for today is knowing when to ask for help. I've become REALLY good at remote tools since I've been doing this remote thing (even before). I've used NetMeeting, Remote Assistance, GoToMeeting, VNC, CoPilot.com, LiveMeeting, Hamachi and a dozen things in-between. 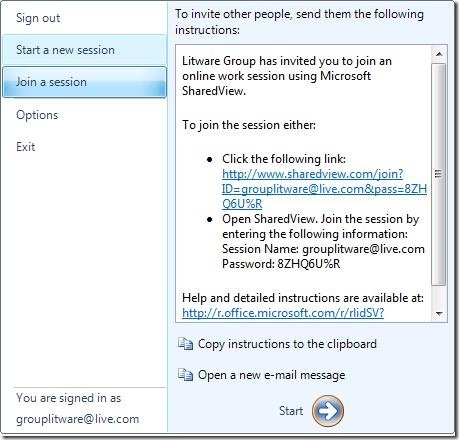 Nothing has come close to the ease of Microsoft SharedView. It isn't heavyweight like LiveMeeting or fuzzy like VNC, plus it lets you show your screen to up to 15 other people. One of the coolest things is that everyone gets their own "personal mouse pointer" with their name hanging off it, so you can see what someone is referring to when they are talking! Today when I was at life's lowest ebb, I called Rob and Phil and said "guys, I need a code review." I did a Vonage conference call and they logged into the Shared Session using just my email address. Bam. No pausing, no firewall futzing, it's the greatest thing since FolderShare. I hope it stays free and wonderful, because it saved my bacon this evening. Whew. Now I can sleep. Awesome. I'm downloading it right now. I wish I knew about this 2 hrs ago when I had to have 2 other people help me with a SharePoint install I've been wrestling with for 2 days. AGHHHH!!!! They certainly don't make it easy. This is a nice piece of software, indeed. But isn't it a complete overlap with Windows Meetingspace (or what the name is) from Vista? "What's that?, A lightweight communication product from MS you say? Show me!" Unfortunately, as with Communicator, I've relegated it to the seldom used apps list. It just doesn't seem to work. Sure, there have been times when I've been able to get it running, and the results for things such as peer reviews have been outstanding. Unfortunately, more often than not the session fails to even establish. The best remote worker application that I have from MS is OneNote running on my TabletPC - the perfect virtual whiteboarding solution! Wow, I was searching for an application like this for a colleague that has to pass some time home in convalescence after a surgery operation. So far, VNC was the only option, but it's way too complex for non-IT people like him. I'll give it a try ASAP. Working from a home office definitely can lead to a feeling of solitary confinement. During my few years working from home was when I first started using dual monitors. For awhile, I went to 3 monitors in my home office, and the 3rd was dedicated to IM windows. After joining Business Integration Group, I started to realize how much I had missed working from home. As you mentioned Scott, the ability to stop over at someone else's desk, or call someone over to look at your screen--it's just priceless. At work, I encourage my team to do a lot of peer reviews and pair programming (not quite XP style though). Those concepts seem to help the entire team. I don't miss working from home. But the traffic to the office stinks! My coworkers and I have been using SharedView for approximately 6 months and it has become one of our favorite tools. We probably use it 3 or 4 times per week and have only encountered problems connecting to each other 2 times. I just hope it continues to be free. I tried shared view back in july ( I think that was its first beta ) and found performance not quite on par with gotomeeting. Have you used gotomeeting at all, how does beta 2 compare? Cool. But... Hmmm... only works on windows? I've been using Yugma for 6 months (see www.yugma.com). provides super easy instant desktop sharing free for up to 10 people. works on both Mac and Windows, and between Macs and Windows. With more and more macs around, I think they should make it a bit more cross platform oriented... right? "With more and more macs around, ... blah blah blah"
Seriously? Apple doesn't let OSuX run on my Dell, but Microsoft should make MORE software for the Mac? No, I'm pretty sure that you're wrong on that one. I used SharedView with great success in my old job. I thought it worked really well, and coupled with Live Messenger (allowing voice communications) it can be a really great tool for 1:1 communications. In cases where conference calls were required, we used Skype. All of this is available free and work brilliantly. I have been using this tool for a while... but I feel copilot.com does a fairly better job. From what you guys are saying, this looks like very promising software. So I downloaded it to try it out. It installed fine. You represent that you are at least 18 years of age, have attained the age of majority where you live, that you are a resident of the United States, and that you will use the Service only within the United States. You also represent that any information you submit is true and correct. You may only use the Service if you agree to these terms. If you do not agree, do not use the Service. How many beta apps have that agreement in them! Is there a technical reason for this? Or is it an oversight? I'd suggest that rather than encouraging Microsoft's non-US customers to ignore the Service Agreements, it would be better to relax the terms. Or give a good explanation and warn people at the Download stage that the software is only allowed to be used within the U.S. Anyway, I'm having some of my most stressful days I've had for a couple of years. I don't know if it's any consolation to you, but I've been at a low ebb this morning and reached for my newsreader and hanselman.com. Thanks for your years of great blogging - your blog one of my favourites. You are are certainly the sort of developer, father and all-round nice guy that I strive to be. You're doing some great work here! David - That's nuts! I'll check on it. If you know the solution I would really appreciate it otherwise I will keep searching. Yeah I did actually read the Service Agreement, and I have a confession to make.. I am not from the US (dun dun dunnnn!) - who thought of the crazy rule that you may not live in the US, but can only use the service in the US?!?!! "Sorry honey, Im just flying to the US, I need to use SharedView". But I am sure Microsoft have been grateful for the large amount of non-US feedback though that has helped develop the product into the (pretty damn good) product it is! It probably has to do with encryption techniques. By U.S. Law there are some types of encryption that cannot be exported. Basically encryption technology *can* be exported to most countries, it can only be done after a government review of the softtware. If this is still beta that review probably hasn't been done, hence the U.S. only stipulation. This is an excellent tool, i found it not too long ago and have already used it on multiple occasions. Its funny that I had thought of making something exactly like this about 3 months ago but Microsoft already had beat me to it! I'm making use of the GoToMeeting tool, but SharedView looks cool! I just started working from home about a month ago, it's definitely an adjustment. Aside from feeling completely crazed if I don't leave the house, working from home is all for better - I really enjoy it. By the way, nice work on the ASP.NET Wiki. Krishna, it should be this week...earlier than the Amazon date says. There are very few countries that are on the "do not export encryption technology" list. And normally EULAs specify that list, rather than blanket ban all non-US users (heck, even Canadians are not legally allowed to use SharedView!). Thanks for looking into this, Scott. The final release is out on Microsoft.com/downloads, so do not pickup the beta link on this page. I've been as stressed as I've been in my life, trying to learn a new technology deeply enough to teach it. It's one thing to learn a tech enough to be capable, but in my new role at Microsoft I'm feeling more of a sense of responsibility than I did when I was just Joe Public Who Talks Loud. Unfortunately I do not believe SharedView was put through good testing. Latency issues just seem to undermine the goodness of this software. Then again, many seem to have had better luck with the software so it just might be me. Hopefully there will be future versions or something. Great utility - thanks for posting mate - PS - great blog... love it - keep u pthe good work.